Disabled people – disabled through authorities and politicians – have no right to live! Claim for human rights, aid, food, medicine, investigation and LIFE! 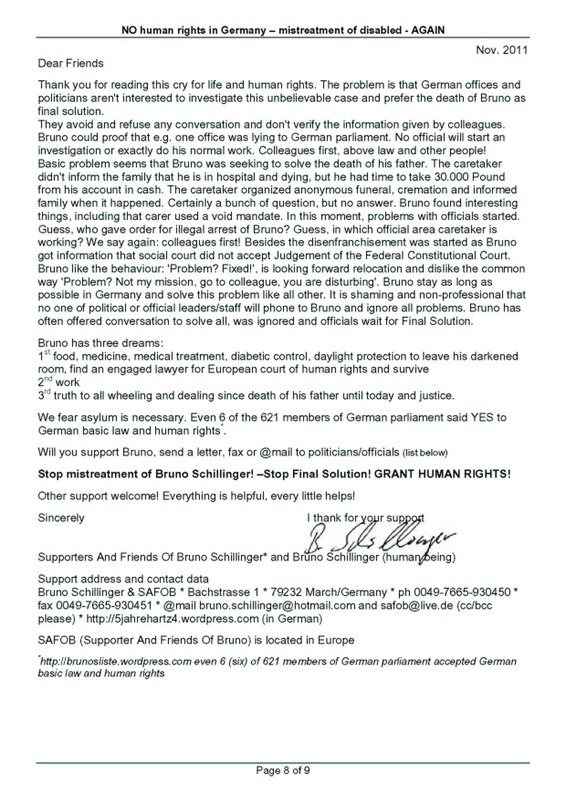 Distribute Bruno’s cry for his life, please! Stand up for human rights! We ask for your protection of disabled people. Our human rights: Everyone’s right to life shall be protected by law. – No one shall be subjected to torture or to inhuman or degrading treatment or punishment. My name is Bruno Schillinger, I keep my fingers crossed that these aren’t my last words, but I fear it. 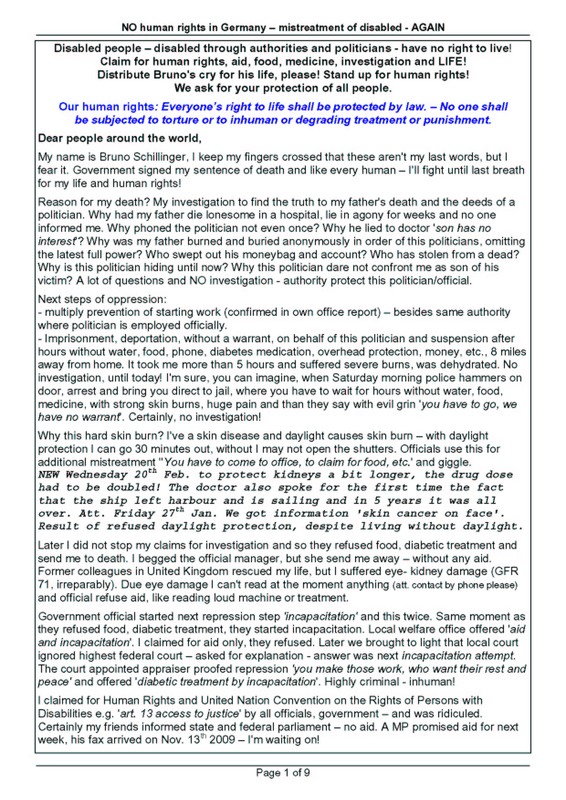 Government signed my sentence of death and like every human – I’ll fight until last breath for my life and human rights! Reason for my death? My investigation to find the truth to my father’s death and the deeds of a politician. Why had my father die lonesome in a hospital, lie in agony for weeks and no one informed me. Why phoned the politician not even once? Why he lied to doctor ‘son has no interest‘? Why was my father burned and buried anonymously in order of this politicians, omitting the latest full power? Who swept out his moneybag and account? Who has stolen from a dead? Why is this politician hiding until now? Why this politician dare not confront me as son of his victim? A lot of questions and NO investigation – authority protect this politician/official. – multiply prevention of starting work (confirmed in own office report) – besides same authority where politician is employed officially. – Imprisonment, deportation, without a warrant, on behalf of this politician and suspension after hours without water, food, phone, diabetes medication, overhead protection, money, etc., 8 miles away from home. It took me more than 5 hours and suffered severe burns, was dehydrated. No investigation, until today! I’m sure, you can imagine, when Saturday morning police hammers on door, arrest and bring you direct to jail, where you have to wait for hours without water, food, medicine, with strong skin burns, huge pain and than they say with evil grin ‘you have to go, we have no warrant‘. Certainly, no investigation! Why this hard skin burn? I’ve a skin disease and daylight causes skin burn – with daylight protection I can go 30 minutes out, without I may not open the shutters. Officials use this for additional mistreatment ”You have to come to office, to claim for food, etc.‘ and giggle. NEW Wednesday 20th Feb. to protect kidneys a bit longer, the drug dose had to be doubled! The doctor also spoke for the first time the fact that the ship left harbour and is sailing and in 5 years it was all over. Att. Friday 27th Jan. We got information ‘skin cancer on face’. Result of refused daylight protection, despite living without daylight. Later I did not stop my claims for investigation and so they refused food, diabetic treatment and send me to death. I begged the official manager, but she send me away – without any aid. Former colleagues in United Kingdom rescued my life, but I suffered eye- kidney damage (GFR 71, irreparably). Due eye damage I can’t read at the moment anything (att. contact by phone please) and official refuse aid, like reading loud machine or treatment. Government official started next repression step ‘incapacitation’ and this twice. Same moment as they refused food, diabetic treatment, they started incapacitation. Local welfare office offered ‘aid and incapacitation‘. I claimed for aid only, they refused. Later we brought to light that local court ignored highest federal court – asked for explanation – answer was next incapacitation attempt. The court appointed appraiser proofed repression ‘you make those work, who want their rest and peace’ and offered ‘diabetic treatment by incapacitation‘. Highly criminal – inhuman! 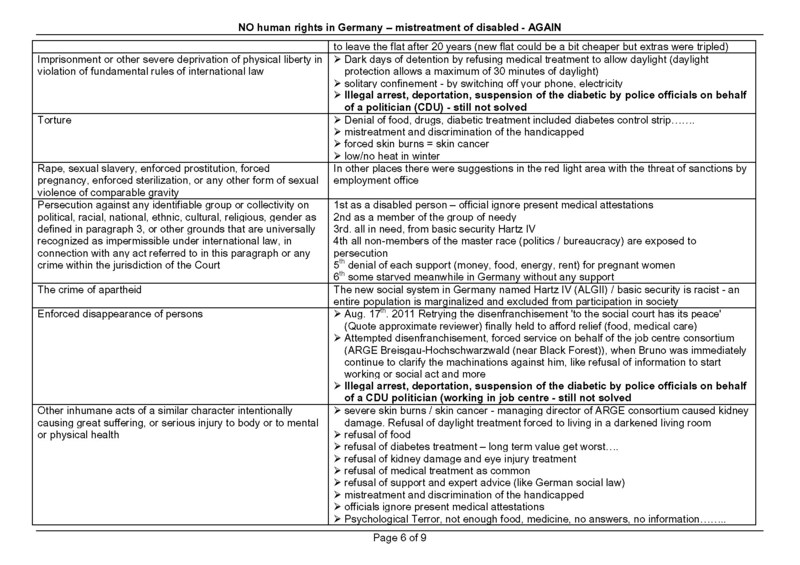 I claimed for Human Rights and United Nation Convention on the Rights of Persons with Disabilities e.g. ‘art. 13 access to justice‘ by all officials, government – and was ridiculed. Certainly my friends informed state and federal parliament – no aid. A MP promised aid for next week, his fax arrived on Nov. 13th 2009 – I’m waiting on! uncontrolled (cold, bleeding legs=diabetic foot), now skin cancer too). And that I can’t do anything, not even read a book or newspaper or do my paperwork. 3rd I cant believe that our officers and politicians who made an oath to constitution and human rights, fight against people with disabilities. That they legalize the denial of food, diabetic treatment, causing life danger, kidney damage, early dead. They explained that this refusal is NO murder attempt and nothing crime else. High official confirmed the question ‘Is refuse of food and diabetic treatment attempt murder – yes or no?‘ – ‘NO, a resounding NO!‘. Again and again I asked, “Have you respected SGB, constitution, Human Rights, UN CRPD – Yes or No?” No response until today! They know that they are committing crimes against human rights! So I reminiscent to dark periods in history and euthanasia. The old, dark German ages are back! Disabled people have no right to live! Disabled may be slaughtered! So I have to decide: escape or die! Officials recommended escape to United Kingdom ‘go to your colleagues, who saved your life, there you will get food, diabetic treatment, and government will pay double social welfare, we will give you nothing‘. Flee or starve/die! 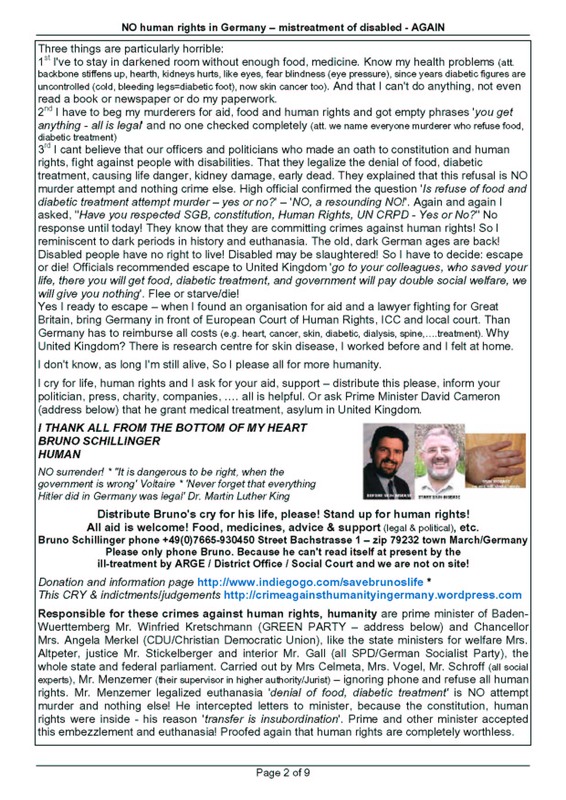 Yes I ready to escape – when I found an organisation for aid and a lawyer fighting for Great Britain, bring Germany in front of European Court of Human Rights, ICC and local court. Than Germany has to reimburse all costs (e.g. heart, cancer, skin, diabetic, dialysis, spine,….treatment). Why United Kingdom? 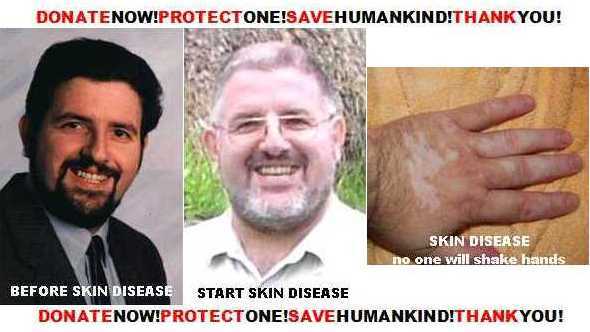 There is research centre for skin disease, I worked before and I felt at home. I don’t know, as long I’m still alive, So I please all for more humanity. I cry for life, human rights and I ask for your aid, support – distribute this please, inform your politician, press, charity, companies, …. all is helpful. 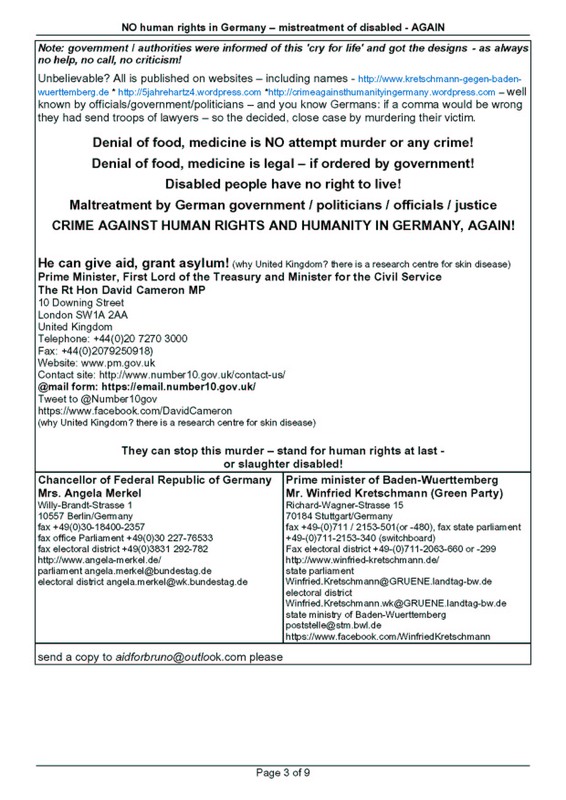 Or ask Prime Minister David Cameron (address below) that he grant medical treatment, asylum in United Kingdom. All aid is welcome! Food, medicines, advice & support (legal & political), etc. ill-treatment by ARGE / District Office / Social Court and we are not on site! 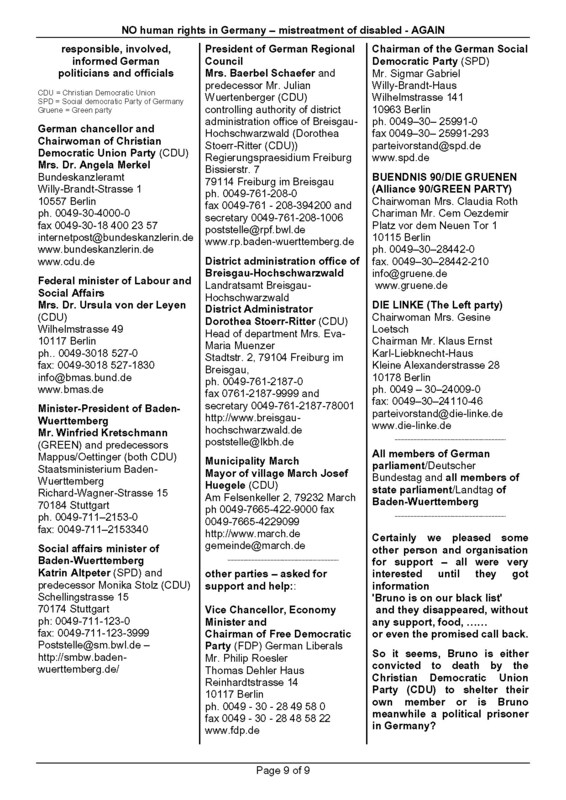 Responsible for these crimes against human rights, humanity are prime minister of Baden-Wuerttemberg Mr. Winfried Kretschmann (GREEN PARTY – address below) and Chancellor Mrs. Angela Merkel (CDU/Christian Democratic Union), like the state ministers for welfare Mrs. Altpeter, justice Mr. Stickelberger and interior Mr. Gall (all SPD/German Socialist Party), the whole state and federal parliament. Carried out by Mrs Celmeta, Mrs. Vogel, Mr. Schroff (all social experts), Mr. Menzemer (their supervisor in higher authority/Jurist) – ignoring phone and refuse all human rights. 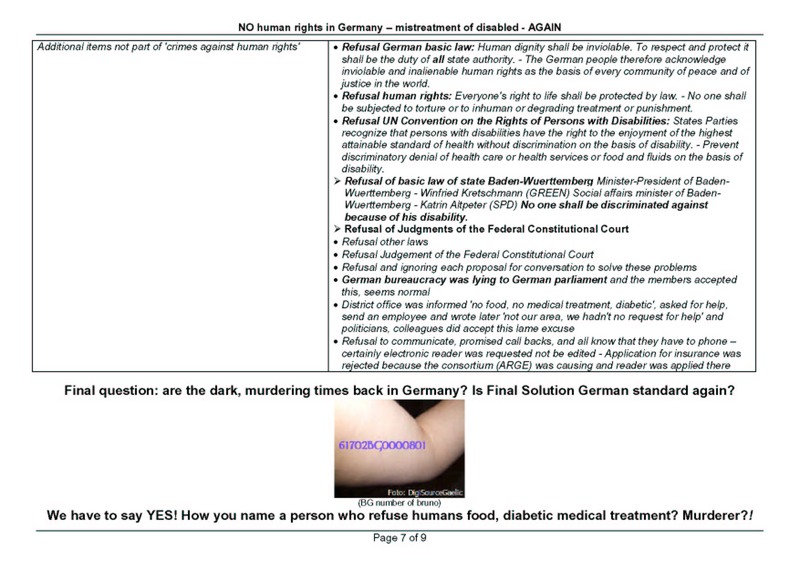 Mr. Menzemer legalized euthanasia ‘denial of food, diabetic treatment’ is NO attempt murder and nothing else! He intercepted letters to minister, because the constitution, human rights were inside – his reason ‘transfer is insubordination‘. Prime and other minister accepted this embezzlement and euthanasia! Proofed again that human rights are completely worthless. Note: government / authorities were informed of this ‘cry for life’ and got the designs – as always no help, no call, no criticism! Unbelievable? 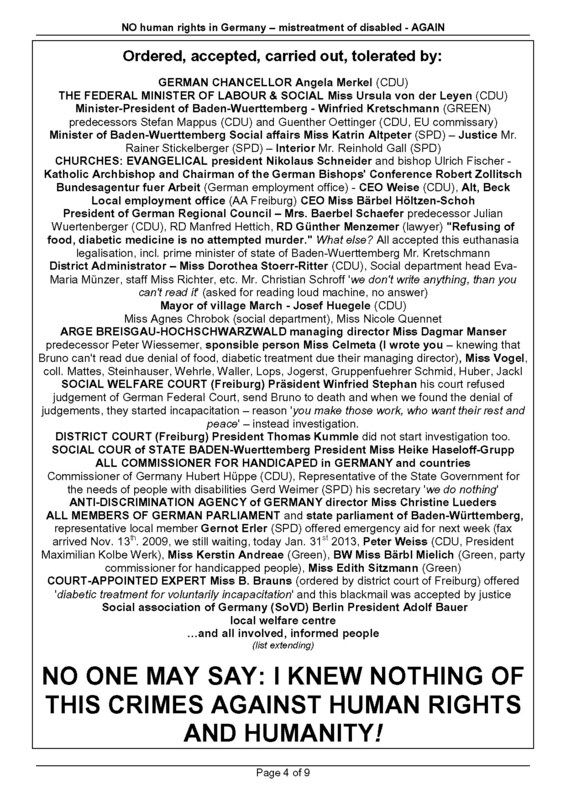 All is published on websites – including names – http://www.kretschmann-gegen-baden-wuerttemberg.de * http://5jahrehartz4.wordpress.com *https://crimeagainsthumanityingermany.wordpress.com – well known by officials/government/politicians – and you know Germans: if a comma would be wrong they had send troops of lawyers – so the decided, close case by murdering their victim. Denial of food, medicine is NO attempt murder or any crime! Denial of food, medicine is legal – if ordered by government! Disabled people have no right to live! 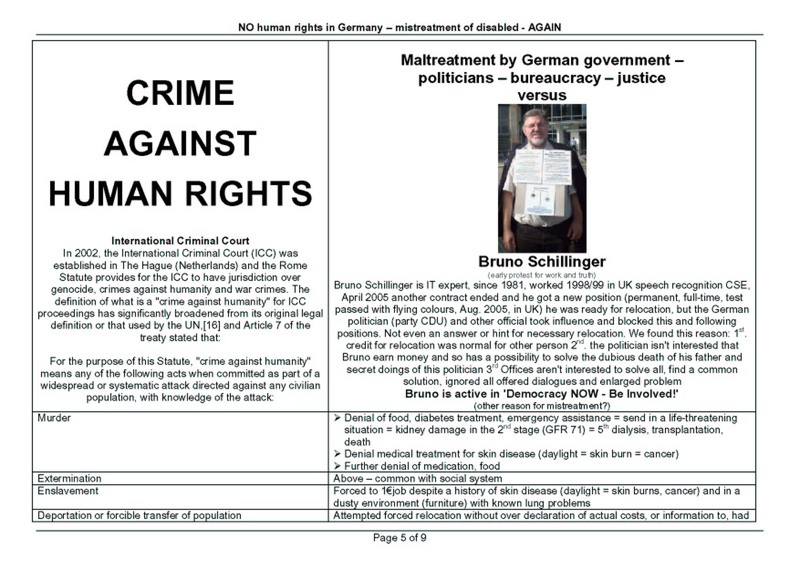 CRIME AGAINST HUMAN RIGHTS AND HUMANITY IN GERMANY, AGAIN!